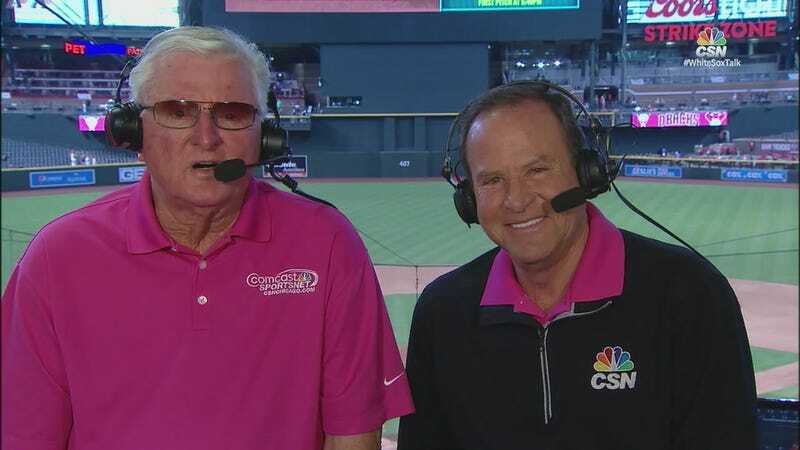 Chicago White Sox announcer Steve Stone has been one of the best color men in baseball for decades, and for half the year—the half he spends calling Sox home games with Jason Benetti—he remains one. During the other half of the year, which he spends calling Sox road games with Hawk Harrelson, he becomes subject to the same brain-wasting disease that afflicts everyone exposed to the Hawk. Is Harrelson talking about anyone in particular when he raises his ideas about how the greatest leaders retain their childlike qualities? I don’t want to know. Disclosure: The author of this piece has been provided Gordon Beckham’s used footwear by the Chicago White Sox, and has been sent a Hawk Harrelson alarm clock by a White Sox enthusiast, though he has yet to pick it up from the post office. His opinions are his own.